The HW2800 Series Hook-Up Wire is a 250 Volt rated single conductor appliance wire with MIL-W-16878E (Type ET) rating and is ROHS compliant. It is silver plated copper to minimize oxidation and is available as solid or stranded in multiple colors. 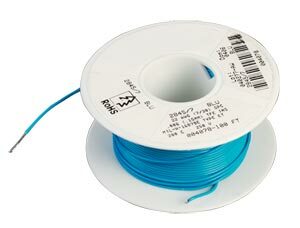 This PTFE insulated wire can be used in military harnessing, medical electronics, power lead supply and appliance wire applications. Omega has hundreds of different types of Hook-Up Wire in assorted gauges and colors, solid or stranded conductors, 100 and 1000 foot spools, many for immediate delivery.